In what can be described as a double whammy, the Christian Association of Nigeria, CAN, in the 19 northern states and Abuja, as well as members of the National Christian Elders’ Forum, NCEF, over the weekend, disowned some pastors who made a solidarity visit to President Muhammadu Buhari at the Aso Rock Presidential Villa last week. Presenting themselves as members of Arewa Pastors’ Non-Denominational Initiative for Peace in Nigeria, and led by Bishop John Abu Richards, the group had paid a courtesy visit to President Buhari, urging him to continue his good works and not be distracted by nay sayers. The President thanked members of the delegation and also used the opportunity to debunk accusations in some quarters that he is biased against Christianity. But in a swift reaction, both CAN and NCEF came out strongly to lampoon the Arewa Pastors in two separate statements. According to a statement signed by Reverend John Hayap, CAN’s publicity secretary, “these folks who described themselves as Arewa Pastors are unknown to us,” insisting that the body is not known to the Christian Association of Nigeria in the North and cannot be said to be representing Christians in the North. “We have searched through all our chapters in the 19 Northern states and Abuja and we found out that the leader of the delegation and most of them reside in Port-Hacourt, Rivers State,” the CAN PRO stated. He alleged that the leader of the group is from Benue State, according to findings with most of them from the South-South states. Rev. Hayap wondered why the Christian leaders did not seize the opportunity of being with the president to draw attention to Leah Sharibu’s plight. 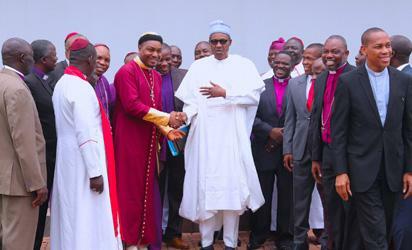 On its part, the NCEF, in a statement signed by the chairman, Elder Solomon Asemota, said “President Buhari made a veiled reference to NCEF in his speech when a group of persons purporting to be Arewa Pastors’ Non-Denominational Initiative for Peace in Nigeria led by one Bishop John Abu Richards visited him”. According to NCEF, “this group portends danger to all Christians in Nigeria, especially when these impostors want the President to link them with the security agencies. One newspaper quoted them as saying: ‘we demand His Excellency, 1. That you support our 5,009 Arewa Pastors Peace and Unity National Delegate Prayer Congress at the Eagle Square on Thursday, April 26, 2018. We will want His Excellency to link us with the relevant security agencies in our crusade for peace and fight against hate speeches and those dark walls that separate us as we will network with our counterparts from the East and West to hand over those of our colleagues being used by the enemies of our togetherness to inject confusion and false stories into the public space resulting to the destabilization of peaceful co-existence we were enjoying in the country’”. “This request,” NCEF pointed out in its statement, “shows clearly that these people are not Christians much less pastors. When a child of 15 years, Leah Sharibu, can defy death, they are asking for security protection”. On the issue of Islamisation raised by the Arewa Pastors, NCEF pooh-poohed their position, saying “this statement portrays ignorance of the meaning of jihad. Muslims killed in jihads are martyrs while Christians and non-Islamists including traditional worshippers are the victims of conventional jihads. It is stealth jihad by Islamists(fundamentalists) in the establishment who have assembled impostors posing as Christian pastors to promote political Islam by discrediting responsible Nigerians in their defense of Democracy and Rule of Law. “This explains why no Christian should speak in defense of Islamism or political Islamism because of extreme ignorance on the subject. It is clear that this body of impostors of Christianity wants protection in their crusade against democracy in the promotion of Sharia in Nigeria. The same security that did not protect Leah Sharibu, now must protect them against Sharibu’s religion. In the face of the above fact, CAN is being gradually replaced by impostors before the present administration,” NCEF chairman stated. The Arewa Pastors, during their visit, had pledged loyalty to President Buhari: “Your Excellency, we the 19 Northern States pastors under the New platform called the Arewa Pastors Non-Denominational Initiative for Peace in Nigeria believe in your leadership and we are here to let you know that we are fully standing by you and your government to ensure that you succeed and peace is restored to every and corners of the country. “And to counter those deceiving and poisoning Nigerians with fake news to destroy your good intentions for the country especially those giving the impression that you are against Christians and some ethnic groups in Nigeria which is a big lie for instance: Some Pastors using places of worship to preach hate. People using Church to preach violence”. The post Northern CAN, Christian elders disown Arewa pastors appeared first on Vanguard News. Next How prepared are you to rise above challenges?